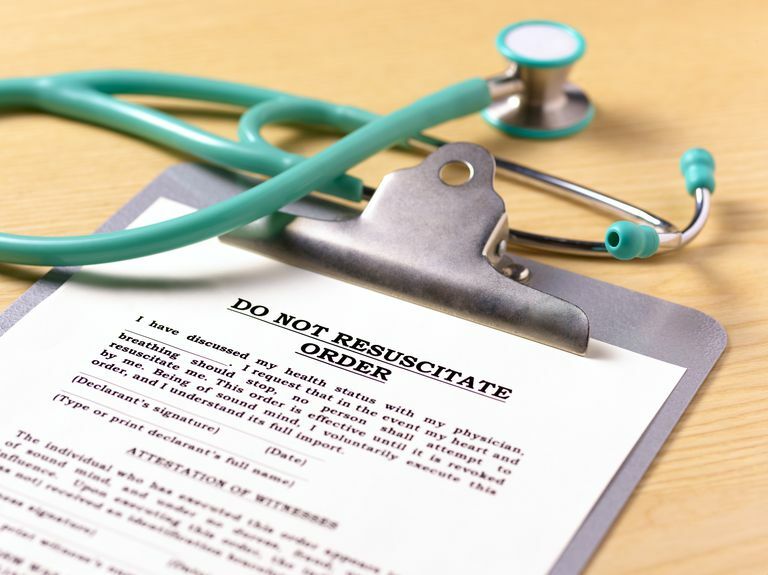 A do not resuscitate (DNR) order is the order for healthcare providers not to perform CPR on a patient with cardiac arrest. DNR orders are unique because CPR is the only medical intervention that requires an order not to administer it. DNR orders come from physicians, not from patients. If a patient wants CPR to be withheld, he or she has to discuss the decision with a physician to get the order written. If the patient is unable to actually discuss her wishes with the doctor, there are different end-of-life documents that cover a patient's wishes called advance directives. Advance directives help guide physicians' decisions if the patient can't be consulted. Durable powers of attorney allow others (often family members) to make decisions for an incapacitated patient, usually within guidelines outlined in the document. It's common for families to use a combination of the durable power of attorney and advance directive to help the physician make the call. Like other complicated medical care in the United States, the application of DNR orders varies from state to state, especially regarding out-of-hospital (ambulance) care. Some states have standardized forms for DNR orders; if the order is not written on that specific form, it cannot be honored. Other states are less regimented, honoring any type of DNR order. Many states allow emergency responders to follow DNR orders written to other care providers, even if they aren't written on standardized forms. For instance, paramedics and emergency medical technicians are usually allowed to follow DNR orders written for the staff of a nursing home. They may also be able to honor orders written for patients getting nursing care at home if the home-care nurse has a copy of the DNR order in hand. Each state is different, and municipalities may differ within each state. DNR orders must be written by physicians rather than verbalized. There are exceptions to this rule, such as an emergency medical service physician ordering an ambulance crew to withhold resuscitation via the radio or a registered nurse taking an order from an admitting doctor over the phone. Generally, there are safeguards for these exceptions to make sure the order is validated later. Written DNR orders must include the patient's name. It seems silly, but medications and other procedures are often administered to the wrong patients; following a DNR order with the wrong patient would be disastrous. DNR orders must be dated. Depending on the state, orders may expire after a certain amount of time or there may be a deadline for the physician to follow-up. Even if a DNR order doesn't expire, a particularly old order may prompt caregivers to revisit the decision with patients. The DNR order must be signed by the physician. In those cases where orders were taken by a nurse over the phone, states usually set a deadline for the doctor to physically verify and sign the order--in California, for example, a doc must sign the DNR within 24 hours. If you or a loved one has a DNR order and you want the order to be honored outside of the hospital, keep the physical order on hand and display it very conspicuously wherever rescuers might find you (or the patient). Make a point of telling rescuers when they arrive. It's a good idea to have more than one copy available and displayed, as well as a copy to accompany the patient to the hospital. If you are traveling, ask your traveling partners to have a copy of your DNR order on them at all times. Keeping a copy on the patient isn't always helpful to rescuers, who are likely to immediately remove a patient's clothing and are very unlikely to look in a wallet or purse. Some sort of medical jewelry may be helpful. MedicAlert Foundation provides jewelry designed specifically for patients with DNR orders. The foundation keeps a copy of the order on file, and are capable of faxing it anywhere in the world. MedicAlert's jewelry contains a toll-free phone number rescuers can call to request the copy. Hospice programs usually require DNR orders as a condition of participation. In those cases, calling an ambulance may not be necessary. Contact your hospice provider and ask about the procedure to follow when someone dies while enrolled in their program. The inconsistent application of DNR orders means some patients get less than optimal care once providers are aware of the presence of a DNR. There still needs to be more study on this issue, but some healthcare providers will even disregard basic care to patients with DNR orders. It's important to remember that a DNR order is not an order to withhold all treatment for a patient, but simply in order not to resuscitate a patient. The definition of resuscitation can be complicated. Some doctors only withhold chest compressions while still providing advanced care like mechanical ventilation--at least until there is no longer a pulse. Other physicians will withhold any advanced treatments from a patient with a DNR order. Because of these issues, for anything other than a terminal diagnosis--like cancer or some end-stage chronic conditions--getting a DNR order may not be the right decision. Discuss the options with your doctor now rather than later, but don't feel pressured to make up your mind about end-of-life decisions. Keep in mind that if we're just talking about withholding CPR, it may be better to let rescuers attempt resuscitation during an emergency. There is little chance that CPR out of the hospital will be successful anyway, and the ethical dilemma will be avoided. Do All States Have "Good Samaritan" Laws? Are You Ready to Do CPR?